Way back in May I came across this article from TheKitchn.com about composting without compost know-how/a yard or dedicated composting space/a garden/need for compost. I had been wanting to compost for a long time but wasn’t sure if we could. We don’t have the space and didn’t need the compost. It seemed like an awful lot of work for something we didn’t have a use for. 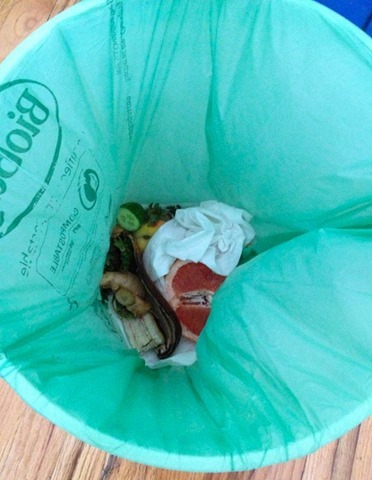 But it also seemed grossly negligent to me to keep tossing our food waste and daily compostable items into the trash can, in a plastic bag, into a landfill. I felt so frustrated about this issue for so long so when I read that article I was elated to see that it concluded with links to composting pick up services all over the US. I instantly knew that was the right way for us to compost! 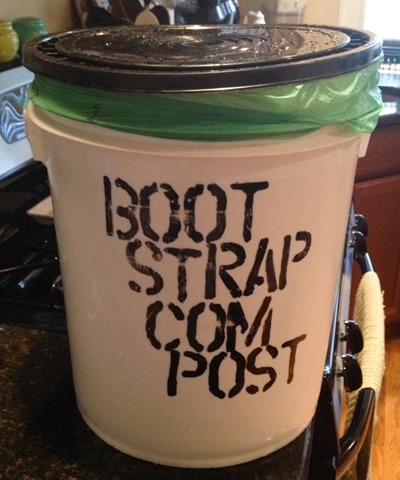 I immediately checked out the Greater Boston compost service: Bootstrap Compost. Their website was comprehensive and made the process seem so simple. I sent the link to John who was totally on board. Bootstrap’s website invites questions to I immediately emailed them with all of the annoying questions I could think of – doesn’t compost stink? won’t it looks gross? will our neighbors hate us? will it attract bugs/rodents/animals? do we have to compost indoors? 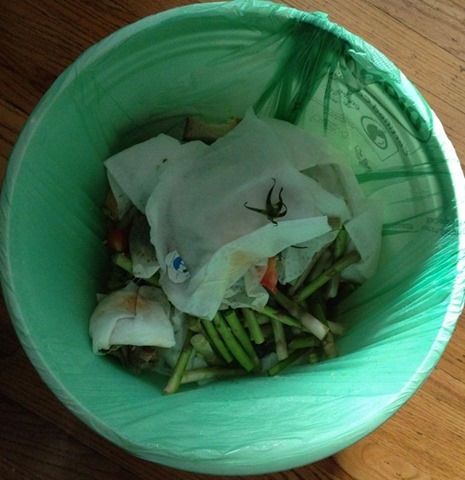 will leaving our compost outside in the summer make us want to puke? – you know, all of the pertinent questions. Of course I received a warm and informational email back. Long story short, composting isn’t as gnarly as you think and even if it was, the benefits far outweigh the downsides. It wasn’t a hard choice – we signed up right then and there. 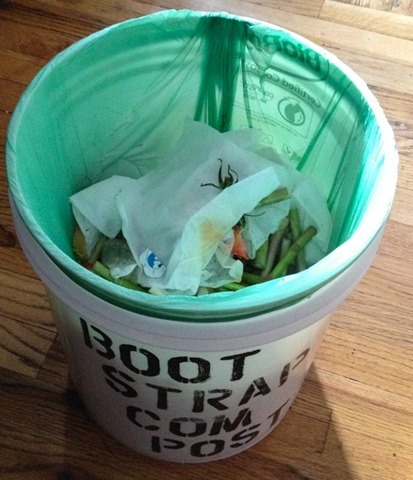 So let me tell you a bit more about how Bootstrap Compost works for us. 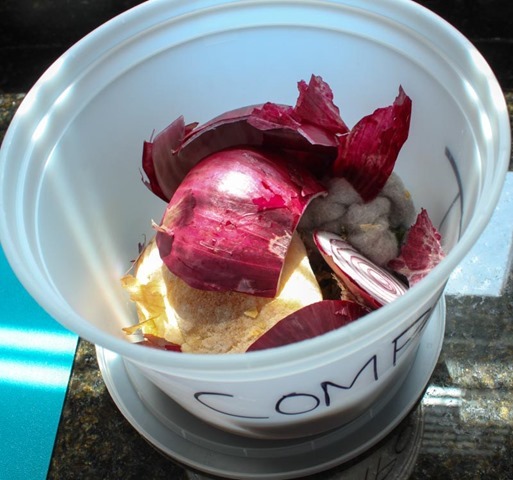 We’ve been composting for a little over 2 months now; enough time that it now makes sense to write about. 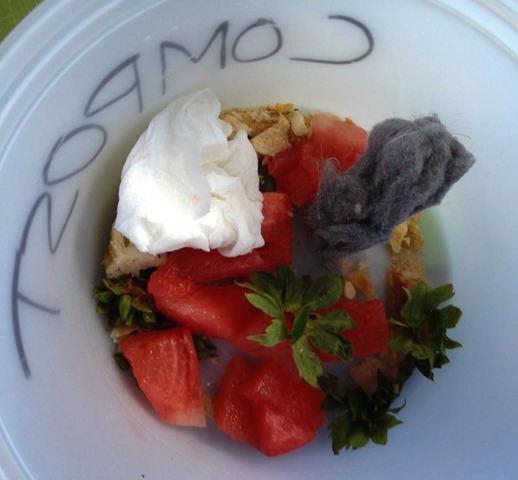 Each week we receive a 5 gallon bucket (with a super tight lid, no bugs or animal intruders can get in!). Over the course of the week we fill our bucket with compostable materials (more on that below). Every Wednesday our filled bucket is picked up by a Bootstrap staffer (on foot, by bike, by handtruck/cart, seldomly by car) and a clean bucket is left. Repeat for the next week! Super easy. The cost to us is $32/month. Well worth it. So what do we do with our compost? Well, we opt not to receive any back. Since we don’t have a garden, or need for compost at all really, we donate it back to the community which means Bootstrap gives it to local schools and community garden projects on our behalf. More warm fuzzies. One last thing that I love about our particular service: Bootstrap just gets it. Aside from this amazing service they provide (which is genius in an eco-minded place like Boston), they provide lots of opportunity for feedback and a real glimpse into their everyday. They have very active Instagram, Facebook, and Twitter accounts which is cool for a desk jockey like me to voyeuristically check out their hands on work everyday. They also send reminder emails the night before your pickup day. Since we keep our Bootstrap bucket on the back porch we have a little indoor compost container we use to avoid making 10 trips a day to the porch. We use this one gallon tupperware container while meal prepping, stash it in the fridge until it’s full, and when we’ve filled it up we empty it into the bucket out back. What’s so great about composting? I know, right?! A lot of this stuff I had no idea about.